What's in Your Cupboard? | What you need to know to cook tonight! Hello everyone!! We have moved our blog! June 5, 2013 by What's in Your Cupboard? July 9, 2012 by What's in Your Cupboard? In a large container combine concentrate and cold water stirring until completely dissolved. Add Lime juice, mint leaves & club soda. Chill well. Strain spritzer to remove mint leaves. Serve over ice with fresh mint springs & fresh lime wedges. TIP to bruise the mint leaves press leaves with the back of a spoon. March 28, 2012 by What's in Your Cupboard? 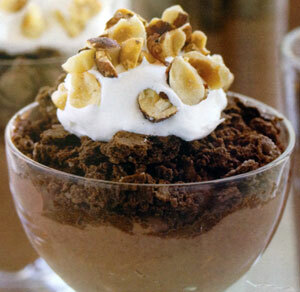 Place the mousse ingredients in a food processor for about 20 seconds or until smooth. In a small microwave-safe bowl melt chocolate chips on high for 1 minute & stir until smooth. Add melted chocolate & tofu mixture to your food processor mixing until smooth. Transfer mousse to a small-medium bowl; cover & let chill for at least 2 hours. Layer individual cups (9 total) with 1/3 cup mousse mixture, graham crackers, top with 1 tbsp. fat-free chipped topping & sprinkle with 1 tsp. hazelnuts. March 25, 2012 by What's in Your Cupboard? Combine vinegar, honey, olive oil, salt & pepper in a small bowl; whisk all dressing ingredients together. Set aside. Combine lettuce oranges, avocado, & onion in large bowl, drizzling dressing over top, & toss gently to coat. March 15, 2012 by What's in Your Cupboard? Combine flour, baking soda, & salt in a mixing bowl. Beat butter & sugar in a mixing bowl with a mixer on medium speed until fluffy. Add egg, mixing until combined. Add dry ingredient mixture, mixing on low speed until fully combined. Add currants & caraway seeds. Add butter milk & mix well. Drop tbsp of dough 1” apart on prepared cookie sheets. Bake 12-15 minutes or until light brown. Remove from cookie sheets and let cool on wire racks. March 5, 2012 by What's in Your Cupboard? January 10, 2012 by What's in Your Cupboard? Prepare grill or skillet for chicken breasts. Cook chicken 2-3 minutes each side or until no longer pink inside.